New Delhi: Ten years ago, Odpal D. George would have been an unlikely guest at a Bollywood bash. But last month, the former housekeeping executive at The Park hotel in New Delhi was rubbing shoulders with the Who’s Who of tinsel town at a party thrown by the makers of 3 Idiots in Mumbai. In the intervening decade, the 36-year-old has become the Hindi film industry’s one-stop shop for any shoots in the picturesque but far-flung valleys of Ladakh, located at heights ranging 9,000-25,000ft above sea level. Working with top producers, he has helped coordinate the shooting of films such as J.P. Dutta’s LOC Kargil, Vipul Shah’s Waqt and, now, Vidhu Vinod Chopra’s blockbuster 3 Idiots. His presence has allowed Bollywood crews to shoot their romances and action thrillers in the indigenous yet exotic-looking backdrop of Ladakh, benefiting the local economy and boosting the livelihood of related businesses. While the film industry still spends only around Rs2-3 crore a year shooting in Ladakh, tourism is the economic mainstay of the region and contributes Rs22-25 crore a year. But, perhaps thanks in part to the Hindi films shot in its exotic locales, domestic tourists now outnumber foreign visitors. Of the 80,000 visitors to the region last year, 48,000 were domestic tourists. “We’ve done 15 feature films, 20 advertising films and countless documentaries," says George, who grew up in Saboo village on the outskirts of Leh, the principal town of Ladakh. “George was recommended by two or three people from the Mumbai film industry," says Rajesh Mapuskar, associate director of 3 Idiots, which shot its climax near the Pangong Lake in Ladakh. The production team of the Aamir Khan-Kareena Kapoor-starrer biked around the Himalayas—from Sangla Valley in Himachal Pradesh to Sikkim—before zeroing in on Ladakh. “We were looking for a place that could be out of this world (and) yet in India," adds Mapuskar. “We found Ladakh so beautiful, the landscape, the colour of the sky, water—everything." Life has been a similarly long and arduous trek for George, who had to borrow money from friends in 2002 to fly from Delhi to Leh. It was a make-or-break journey—film-maker Dutta had responded to his first call to Bollywood and wanted to see him the next day. George had recently quit his travel agency job in New Delhi and launched his own travel and tour firm called Himalayan Safaris. 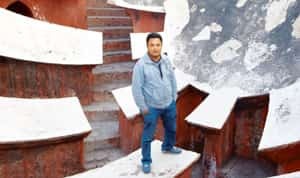 He was packing his bags to return to Ladakh, with an eye on the growing number of domestic and international tourists visiting the region, when he heard that Dutta was looking for a contact to help him shoot a film there. George searched the Internet for Dutta’s number. His pitch impressed Dutta’s wife, and—on borrowed money—he was flying towards an unplanned career and a new life. Dutta’s JP Films arrived with a 180-member team. The shooting for LOC Kargil, based on the 1999 Kargil conflict between India and Pakistan, lasted two months. Arranging the accommodation for such a large contingent was in itself a daunting task. Besides, the grumbling taxi operators’ union had to be convinced that its members would be paid on a weekly basis. “The operators were up in arms, as some earlier film units had not coughed up their dues," says George. Today, they are more than eager to work with him, along with hoteliers and an assortment of other tradespeople. “Movies have certainly given us an additional business," says Tundup Wangyal, general secretary, Ladakh Taxi Operators Cooperative Ltd, which runs the region’s largest network of 1,600 taxis. And George, he adds, has a “good reputation" for payments. In the years since, George has graduated from managing hotel accommodation and transport for film crew to becoming a crucial part of the bulky production process. He has bought equipment required for film shoots and leases them to film-makers who visit Ladakh. Lights, reflectors, camera track and trolleys are all a part of his portfolio now. “Shooting (with the camera crane system) requires weights. So I have bought 330kg of weights. Imagine the crew carrying such heavy equipment back and forth from Mumbai to Leh," he said, adding that the carriage fee would be around Rs40,000-60,000 for the same. “I now plan to buy a camera crane system too (costing Rs25 lakh)." Growing reputation has come with a growing clientele. The makers of ad films have followed Bollywood, and George has helped shoot commercials for the Hyundai Group, Boeing Co., ITC Ltd’s Bingo chips and the Indian Premier League Twenty20 cricket tournament. In an illustration of his versatility and business acumen, George ended up becoming a sub-dealer for Hyundai cars during one of these shoots. He said he has sold some 50 cars in Ladakh in one year. Next on his agenda is expanding his film logistics services to the Kashmir valley and Himachal Pradesh. Predictably, he is shy of divulging his revenue. “I am happy with the business," is all he says, adding that he has recently bought a flat in the Noida suburb of New Delhi. He is, of course, not the only operator in the region. “There are a handful of people like me who are trying to make a business out of Bollywood. But they have not invested so much in equipment. Besides, it is such a small place that we never undercut each other," says George. He was even poised to break into Hollywood a little over two years ago. Warner Bros. Entertainment Inc., one of the biggest Hollywood studios, was planning to shoot parts of a film called Shantaram, based on the novel of the same name by Gregory David Roberts, in Ladakh. George was engaged in a familiarization tour for the studio in late 2007, but the project was shelved due to a strike by the Writers Guild of America. Not one to lose heart, George is happy making deeper inroads into Bollywood through his friends, and their party circuit. “I’ve learnt that the best way to enter Bollywood is through its parties. Knocking on producers’ doors with calling cards does not help," he says. His culinary skills, too, have been of help. George often cooks at Bollywood parties hosted by his friends. Among his unfulfilled dreams is opening a restaurant in Ladakh. The eldest of five siblings, George’s father was an announcer with All India Radio and his mother was a homemaker. Theirs was one of only two Christian families in a village of 150 Buddhist and Muslim households. George initially studied in the picturesque village school overlooking the Indus Valley, but later attended Moravian Institute in Dehradun and the Wynberg Allen School in Mussoorie. After graduating from Hyderabad’s Osmania University, George bounced in and out of jobs in travel and hospitality industries before deciding to launch Himalayan Safaris. His engagement with Bollywood hasn’t hurt that business. “Himalayan Safaris continues to work with upmarket tourists—mostly Italians, Austrians and Americans. We even handled a large Stanford (University) alumni group," says George. The film business has boosted the number of tourists visiting the valley. But, says George, it is as unpredictable as it is lucrative. “Bollywood lacks patience. You can’t come to Leh and think that you will complete shooting the same day and leave. The terrain can be harsh on you. You need to acclimatize." In the last few years, George has also added oxygen cylinders and two doctors on call to his unit. “Seven or eight years ago, there was a medical emergency and two members of a film crew who had heart complications lost their lives," he says. Thanks to his association with films, George is gaining increasing traction among the locals. For instance, he got a boy from Leh the chance to play the young Khan in 3 Idiots. George’s father was cast as the boy’s schoolteacher who, incidentally, had to travel to Shimla for the single shot.